One of two pumps used to retrieve the daily one million gallons of water necessary for cooling the Plum Brook reactor. 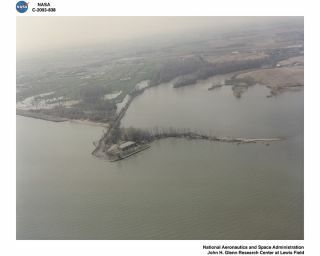 In this historical photo from the U.S. space agency, one of the two pumping stations Plum Brook had in 1983 to obtain raw water from nearby Lake Erie. The reactor required one million gallons of water daily for cooling, shielding, and dilution of radiation. The main one was at Rye Beach (pictured) and the other was at Big Island. They were initially constructed in 1941 for the Ordnance Works and were closed in the late 1945. In March 1958, NACA assumed control of both facilities, but it took several years of repairs and cleaning before both would consistently function properly. They were connected to Plum Brook by 5.9 miles of 24- inch steel piping. Together, they could pump 51 million gallons of lake water per day. The National Advisory Committeee on Aeronautics (NACA) was a precursor to NASA. NACA was created by Congress in 1915.